The last four months have been bad for Tanzania’s small opposition parties as they continue to fall apart through internal rivalries and lack of clear political philosophy. On the mainland the position of the ruling Chama cha Mapinduzi (CCM) party now looks unchallengeable. Provided it retains its unity it seems destined to continue to rule Tanzania for the foreseeable future. At the last election CCM got 59.2% of the vote but took all but some 25 of the seats in the National Assembly. Tanzanian Ambassador in Paris Juma Mwapachu was quoted in Rai as saying that the opposition parties were now so weak and fragmented that they hardly posed any threat to the ruling CCM party. He said he agreed with the late Mwalimu Nyerere that the real opposition would come from within CCM itself, when the party split into two warring factions. The present generation of opposition leaders would have to hand over the mantle to the next generation “before we see a real multi-party system”. He said that the present opposition leaders came from CCM and so had the same “one-party mentality” . On 7th July the Central Committee of the United Democratic Party (UDP) -by nine votes out of eleven -suspended its chairman John Cheyo, who had been regarded with some respect in certain circles in Dar es Salaam, together with his Vice-chairman and other leaders, allegedly for misappropriating ~:lS 61 million of party funds. The next day Cheyo insisted that he was still chairman and had expelled seven leaders from the party including its MP for Kisese, Erasto Tumbo, and the person installed by the Central Committee as the interim Chairman. One of the elements in the dispute was an apparent inconsistency between the Swahili and English versions of the UDP constitution which caused Political Parties Registrar John Tendwa to pause before giving his decision. After examining the English and Swahili versions finally on July 25 he accepted the decision of the Central Committee. The new interim leadership of the party was vested in the acting chairman Amani Nzugile but he was instructed to hold fresh party elections as soon as possible. On August 6 Uwazi reported that the new UDP leadership had filed a suit against Cheyo for Shs 137 million of state subsidy and for the return of five vehicles and party documents. Cheyo accused the new leadership of being funded by the Libyan Cultural Centre but this was subsequently strongly denied by the Libyan Ambassador who said that Nzugile had been given only Euros 500 for a training seminar in Mwanza for 10 UDP leaders. On August 8 the Guardian reported that UDP’s Mwanza Region, its area of greatest strength, still considered Cheyo to be National Chairman ofthe party. A further sign of disorder in the opposition camp was the apparent failure, reported in the Guardian (August 1) of a meeting of the small parties (the most important opposition party, the Civic United Front­CUF -did not take part) to choose candidates for the new Electoral Commission in Zanzibar. Registrar of Political Parties, John Tendwa revoked the registration of the PONA party on grounds that it had contravened the law and its constitution by not electing its leaders. After it had been given another period of grace it called a meeting where leaders were handpicked but Mwananchi reported that the meeting had been marred by violence and walkouts. John Chipaka was elected as party president. 35 delegates from Zanzibar were reported to have walked out on grounds that they had not been paid their allowances. The party has been in shaky existence since 1992. The other party whose registration has been revoked is the Tanzania Peoples Party (TPP). Neither have any MP’s in parliament. To the surprise of many, the Democratic Party (DP) led by Rev. Christopher Mtikila has been registered. 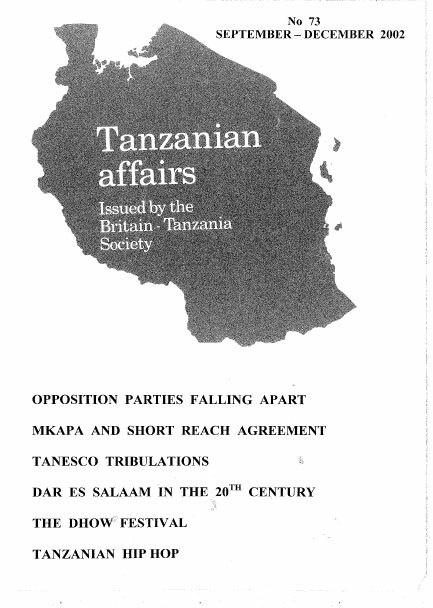 The party first applied in 1992 but was refused registration because Mtikila was not prepared to recognise Tanzania and insisted on Tanganyika being a separate sovereign state. Mtikila said the party would now continue with the task left unfinished in 1993 but he would still push for a separate government for the mainland. He said at that time the people had 400 parastatal organisations that were subsequently sold off. He said the task now would be to fight for the restoration of these public properties. Talking of his track record he said he had been in and out of prison more than 23 times, all while fighting for the ‘people’s rights.’ Well known for his firebrand style of politics, he found himself in court on August 5 accused of sedition after Swahili newspapers had reported him telling a rally that President Mkapa was a ‘foreign citizen’ having been born in Mozambique and Prime Minister Sumaye was ‘a thief. Mtikila’s wife was quoted in the Swahili press as saying that Mtikila believed that Mwalimu Nyerere had been born in Rwanda. After recent changes the composition of the National Assembly has become CCM 253, CUF 3, Chadema 5, TLP 5 and UDP 3 seats. CCM has begun distributing nomination forms for the forthcoming election of its leaders. These elections take place every five years. A Shs 10,000 fee is being charged for each form. For the National Executive Council (NEC) elections there will be reserved seats for women (16), youth (10), parents (10), Zanzibar (20) and the Mainland (20). Nine general seats will be filled in an open election by the national electoral conference. While ordinary candidates have to fill in the forms and vie for the positions available, that is not the case with the National Chairman and two Deputy Chairmen. They are nominated by the party’s Central Committee, seconded by the NEC and then elected by the national conference. CCM members of parliament have been told by the Speaker that they are not allowed to form informal pressure groups. He was referring to the ‘G-55’ in 1993 in which 55 CCM MPs presented a motion asking for a three-tier government (instead of the present two-tier system). In April this year there was the ‘G-46’, supporting a private motion against the employment of management contractors to run the TANESCO power authority. President Mkapa had defused the crisis by reminding CCM MP’s of their duty to support the CCM manifesto at the last elections which included provision for a change in the management of the authority. The MPs were also told by Presidential Advisor Kingunge Ngombale-Mwiru that their activities were likely to boost the opposition and weaken the government. He said the backbenchers had a duty to support the front bench. As this issue of Tanzanian Affairs went to press there were further indications of the disunity between and within Tanzania’s opposition political parties. See article on Page 2 The Guardian reported on August 12th on a ‘fairly big’ rally held on at the Jangwani grounds in Dar es Salaam, attended by conducted by CUF, the Tanzania Labour Party (TLP), the UDP and CHADEMA. Speakers said that the current National Assembly was a rubber stamp which was toothless in the face of the CCM administration. But immediately after the meeting TLP Secretary General was quoted as saying that the two TLP MP’s who had attended the rally would be grilled for defying a directive not to attend and might be subjected to disciplinary action. The reason was that CUF was also there. According to TLP, CUF was cooperating closely with the CCM and was resisting efforts by the other opposition parties to be involved in the implementation of the Zanzibar agreement. The Fifth Festival of the Dhow Countries (June 28 -July 14) celebrated the dhow cultural heritage of the peoples of Africa, Asia, the Gulf States and islands of the Indian Ocean, with ZIFF -the Zanzibar International Film Festival – as its centrepiece. A multitude of events took place daily at historic waterfront venues, on the green at Forodhani Gardens, at the House of Wonders, the outdoor Mambo Club and the amphitheatre of the Old Fort and other locations in Stone Town and in several villages of Nguja. Under the stars at the amphitheatre you could see films such as A Question of Madness -the story of a man born of a black mother but classified as white in South Africa; Mishoni – about a young Tanzanian girl’s circumcision; the French film An Account of a Catastrophe Foretold -how the world’s top decision makers failed to prevent the spread of AIDS; Long Nights Into Day -about South Africa’s Truth and Reconciliation Commission; and the prize-winning, artistically excellent and socially relevant Lumumba, among the 47 films shown from 21 countries. Whatever your music and dance preferences, they too were there. You could choose Egyptian contemporary dance or a Zanzibar ngoma troop, Maasai wedding and war dances or the Parapanda performers of traditional Tanzanian music and dance. And, yes, there was taarab music side by side with Zanzibar hip-hop. Among the art exhibits was Twilight of the African Dhow – stunning photos of life on the historic dhows that capture their grace and practicality, by British-born photo journalist Marion Kaplan. Tara, theTrust for African Rock Art, had an exhibit of prehistoric rock art of Africa from the Sahel to the Southern tip. You could take lessons in Arabic music, traditional pottery or documentary film-making. The women’s panorama at the Old Dispensary attracted men as well to dances, hadithi sessions, and an exhibit of the history of the khanga. The children’s panorama included banner design, riddles, photography and festival song. A lively evening celebrated African song and dance and the chance to meet hundreds of locals and foreign visitors nightly at the outdoor MamboClub. All that in addition to the simple pleasure of strolling the bustling narrow, winding streets of Stone Town, luxuriating on the unspoiled beaches, or sipping a cool drink on your hotel balcony, watching a pair of graceful dhows pass silently across a fiery ocean sunset. After some initial delay, implementation of the CCM-CUF Agreement of October 10 2001 (TA Nos. 71 and 72) is proceeding well. An amendment to the Zanzibar constitution passed by the House of Assembly allows President Karume to establish a new Electoral Commission including opposition members and to appoint two new opposition MP’s to the Assembly. Protests by other small parties (none of which has had any success in Zanzibar elections) that they were being excluded from these arrangements by CUF have been rebuffed by the latter on the grounds that it was CUF which signed the agreement and members of CUF who went to jail, were killed or fled into exile last year after protests in the streets against the election results. Bye-elections in the 16 seats in Pemba from which elected CUF MP’s were expelled (following their boycott of the Assembly) and the one vacant CCM seat arising from the appointment of Dr Shein, a former Zanzibar MP as Vice President of Tanzania, have been scheduled for next March. Speaking at the inaugural session of Tanzania’s International Investors Round Table, in Dar es Salaam on July 17, an initiative supported by the World Bank and the IMF which seeks to improve the investment climate in Tanzania, World Bank President James Wolfensohn said that the Bank supported President Mkapa’s determination to stay the course, encourage private investment and resolutely address the AIDS crisis in the country. President Mkapa gave Mr Woolfensohn ten reasons why foreigners should invest in Tanzania – political stability, correct economic and fiscal policies, abundant resources, investment incentives, unrestrained transfer of capital and profits, investment guarantees, settlement of disputes, the one-stop Tanzania Investment Centre (TIC), Tanzania’s qualified access to Europe and the USA’s AGOA and its geographical location which enabled it to reach a market of over 250 million people in East, Central and Southern Africa. Mr Wolfensohn then added an 11th attribute – President Mkapa’s able leadership. – The East African. Finance Minister Basil Mramba presented his budget for 2002/2003 on 13th June. It was addressed primarily to the weaker sectors of the economy such as agriculture (allocation increased by 101%) and poverty reduction programmes. Investors’ interests were covered by reduced taxes on imported raw materials and on capital and interest on dividends. He included measures to raise the civil service minimum wage to Shs 53,130 but tax exemption on civil servants’ vehicles was stopped. He announced the launching of an Export Credit Guarantee Scheme and said that taxes on cement, aviation fuel, matches, casinos, land, tyres and bicycles were to go down while the road toll would go up. The inflation rate was targeted at 4.25 per cent this year. Foreign reserves would pay for importations for six months. Four foreign firms have submitted bids for leasing and managing Tanzanian Railways: Comazar Consortium (Great Lakes Railways) from South Africa, Geneses and Wyoming Inc (USA), Canac (Canada) and SNCF (France). Later this year the four pre-qualified bidders will be invited to submit their plans for leasing and managing the network. The winner is expected to be announced in September – Mtanzania. Mwananchi (August 1) reported that two of the three firms bidding for the leasing of the Dar es Salaam Water Corporation (DAWASA) had withdrawn as they were not happy about the conditions of the lease and the state of the Corporation. This left BiWater from UK in partnership with Gauff Ingenieure of Germany as the only bidders. Bill Gates of Microsoft, the world’s richest man, has agreed to become a special goodwill ambassador for Tanzania and help to persuade fellow chief executives of some of the world’s top companies to invest in the country – Daily News. When Britain’s Development Secretary Clare Short arrived in Tanzania on 3rd July to face President Mkapa on the controversial purchase by Tanzania of an expensive air traffic control system, the man on the street in Dar es Salaam was expecting fireworks in view of the strongly opposed positions the two had taken on the issue. A few days before her arrival people were reporting that they had seen heavy lorries carrying the equipment to a newly created site at an army barracks. Ms Short had fiercely opposed the deal because of its high cost and had suspended British aid to put pressure on the country to change its decision (see TA No. 72). CUF opposition leader Ibrahim Lipumba had called for publication of a report that had been commissioned by the World Bank which was said to be highly critical of the purchase. He was quoted in Mtanzania as saying that while Shs 36 billion had been spent on the radar, in the last budget only Shs 24 billion had been allocated for rural roads, Shs 31 billion for water and Shs 10 billion for medicine. He said that while attempts were being made by donors to write off debts, the country was now entering into this additional “odious debt”. Mwananchi reported on 17th July that a CCM MP, speaking in a debate on foreign donors had referred to Clare Short as “that troublesome British lady”. Speaker of the House Pius Msekwa asked the MP to withdraw his remarks and to call the Secretary of State by her proper title. The MP complied. However, two days after Ms Short’s arrival, the Daily News, under the heading “Short: Radar Row Over”, reported that Ms Short had stated that the row was over and had announced a new six-year aid package to Tanzania in which the UK would provide the country with at least £45 million in budget support. She was quoted as saying “It’s true that we held back £10 million in order that we could get to the point that we are at now -not to punish Tanzania by taking away money but because of a contract that could have been done better … but you can’t undo it”. She added that lessons should be learnt from the experience. However, she said, despite the new agreement, she still believed that the radar was a “waste of money”. Finance Minister Basil Mramba and Minister for Communications and Transport Professor Mark Mwandosya were said to have been all smiles at the end of Ms Short’s visit. “The meeting was highly successful” they said. On May 30 Home Affairs Minister, Mohammed Seif Khatib said the government has no objection to anyone going to the Bulyanhulu mines to enquire into the alleged death of small miners (TA No 72). He emphasised however that clearance had to be obtained before embarking on such research. The Minister refuted reports that more than 50 artisanal miners were buried alive at the gold mines in 1996. “No government can ever do such a thing,” said Khatib quoted in Majira. The new South African management of the Tanzania Electric Supply Company (TANESCO) caused some surprise on June 11 by issuing a 21-day ultimatum to its customers to settle over Shs 100 billion in outstanding bills. Otherwise they would be disconnected. TANESCO Managing Director Rudi Huysen thanked the 70% of TANESCO customers who paid their bills promptly. Only 10% of Tanzanians had electric power. Others would have to wait a long time to be connected if people refused to pay for the supplies they were receiving. The South African team had finally entered TANESCO head office on 17th May after protracted resistance from employees who wanted to get their terminal benefits before it took over. The new management has a two-year mandate to Improve TANESCO services before divestiture. On April 29 President Mkapa had railed against the previous management saying it had failed to deliver, and that was why the government had decided to contract a foreign firm to run the company. The President noted that the decision was accelerated by revelations arising from audits carried out by three renowned international firms which had revealed gross mismanagement and misappropriation within the state-owned company. In the six years from 1995 to 2000 the company had recorded an aggregate loss amounting to more than Shs 125 billion. Another audit company, KPMG Consulting, revealed in its report that 36 per cent of revenue from the pre-paid (LUKU) meter system did not feature in any of the company reports since 1995. The KPGM auditors also revealed that since 1995 the TANESCO Board of Directors had approved tenders worth 5.6bn/-, which were beyond its powers to sanction. The KPGM report also accused the TANESCO management of failure to command revenue collection, poor management of company assets, funds misappropriation and power leakages which could have been contained. President Mkapa further quoted the report as saying that TANESCO did not know the actual number of its customers and that those who featured in its computerised system differed from the number of connected electricity users. “This means that a good percentage of electricity users have been using power without paying a single cent, since they were not being billed,” he said. He conceded that, as of November last year, government had also owed TANESCO some Shs 42 billion. On July 3 power to the Tanzania Peoples Defence Forces (TPDF) and the Dar es Salaam Water Authority (DAWASA) was cut off. They promptly paid part of their outstanding bills. On 15th July TANESCO disconnected power to hundreds of houses in Zanzibar including those owned by government institutions and departments allegedly for not paying outstanding debts amounting to Shillings 31 billion. Following the success of this programme (people were queuing in TANESCO offices to settle their bills) the company was planning to embark on a campaign against people who have connected electricity to their houses illegally. The Swahili press reported what papers called ‘a big row’ at the Friendship Textile Mill in Dar es Salaam on May 7 when Minister for Trade and Industry, Juma Ngasongwa, entered into a heated argument with workers. The problem was said to have started when the Minister accused the workers of “being lazy” while asking for a pay rise. One angry worker shouted “bull” and the Minister asked the police to arrest him. In the ensuing melee the meeting was called off and the Minister’s car was surrounded. In the end the arrested worker was released and the Minister was allowed to leave. Friendship is a joint enterprise run by Tanzania and China. On June 7 Majira alleged that while the Prevention of Corruption Bureau (PCB) had begun investigating the government’s contract with the Malaysian-financed Independent Power Tanzania Ltd (IPTL) (see earlier issues of TA) it had found that four ministers and one MP had been involved in what it called ‘the shady deal’. The paper said that, while the initial negotiations had been going on, one minister had been offered $200,000 which he had turned down. According to the paper the PCB’s investigation had found a ‘hot potato’ when it seemed that some senior ministers might have been implicated. The PCB was said to have left the matter with President Mkapa to deal with. The Parliamentary Sectoral Committee on Trade had earlier urged the government to take legal and disciplinary action against officials who might have been involved. The government is now paying Shillings 3 billion per month for electricity from IPTL. A CCM MP said that, as TANESCO was not involved in the IPTL, all blame should be borne by the government. He suggested that the IPTL plant should be bought by the government so as to stop the payment of huge amounts of money every month. The leader of the opposition in the National Assembly Dr Kabourou announced that he was also investigating the matter and might be able to name the ministers involved later. Meanwhile, Minister for Energy and Minerals Daniel Yona said that 127 villages were supplied with electricity last year.